Honestly, I just saw more “stuff” in the last 12 days than a Monkey’s Uncle. Overwhelmed folks! This small country sitting above South Africa offers a massive variety of imagery (& fun exploration ops). First off, like many African nations, Namibia sports great wildlife viewing. How about this bad boy? He assumes I’m on the menu? Help!!!!!!!! You want to be knee deep in Elephants? Bring it! Multi-generational viewing of trunk wielding grandparents, parents and kids. Want to see the rest of the pics…click the gallery below or any of the photos! Did I mention the highest sand dunes in the world? That’s right #1 baby! Your fearless leader climbing Mount Everest (well it should be called that). How bout a petrified forest (Dead Vlei, near the Sesriem Sossusvlei Dunes)? Or some Umpa Lumpa trees under the Milky Way! Just kidding, they’re actually called Quiver Trees. Incidentally, the lack of light pollution and dry air make for the best celestial viewing I’ve ever seen. Wooooo! Ok, time to engage the time-lapse video. Strap in. Here we go! Did I mention the Circa 1920s Ghost town of Kolmanskop! The wall colors have been preserved perfectly by the dry air, which has blown in mountains of sand into the long-abandoned structures. I know, your dying to see a map. Relax, it’s coming! We start in Windhoek (the nation’s capital) and head out to the Keetmanshoop Quiver tree Forest. Next stop is the Kolmanskop Ghost town (near Luderitz). Yes, the country was settled by German colonizers. How did you guess? Time to head North for some massive dune exploring in the Namib Naukluft National Park, followed by Flamingo viewing at Walvis Bay (a short drive West) & seal viewing at Cape Cross (a few hours North). You getting tired yet? Final stop…three days in the Etosha National Park for wildlife on steroids. Ok, for the bird lovers in our group…don’t ask! No idea what this is…but it flies. Ok, I’ve literally just scratched the surface here. Click below to see more photos! Woooo. Seriously, what are you waiting for? 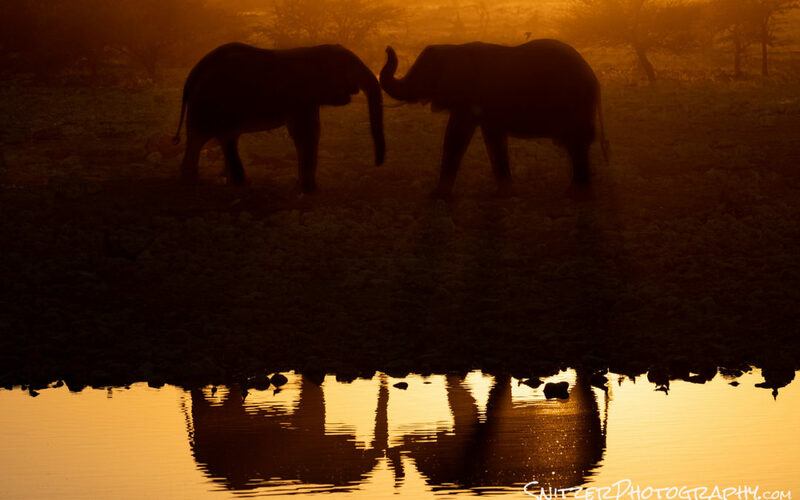 Link for more awesome Namibia photos! Surgeon General’s Warning: You may be loving the images and saying to yourself…I gotta bring the whole family to this place!!! Not so fast Magellan. Namibia is not an easy destination to reach. My itinerary: fly to NYC, with a quick 4-hour layover and follow with a 15-hour flight to Johannesburg, then another 4 layover and 2 hours by air to Windhoek. After arrival plan on spending between 4-6 hours driving (2/3rds of the days) to navigate around or search for wildlife…about 50% of which may be on gravel roads. Ergo, if you don’t like driving…consider yourself alerted. I felt safe traveling in Namibia. The people are friendly, make tourists feel at home and the vast majority of residents speak English. Generally, the streets & buildings are clean. That’s not always the case in some other popular wildlife destinations such as Kenya or Tanzania (which feel considerably more third world/have more poverty/crime/offer less to see outside of furry animals). While driving into Windhoek, I noticed a huge field adjacent to the road filled with shipping containers. Something seemed awry? It turns out that 50% of Namibia’s urban population live in these container villages or tent filled shanty towns. These places operate with no electricity, plumbing or sewer system. And Namibia is considered prosperous compared to most of it’s neighbors! Our main guide had 14 siblings. Three are from his biological mother, the rest are from 4 other women who are referred to as his mum’s sisters. They all celebrate holidays together. His father died when he was only 8 from AIDS. He describes a “promiscuous” culture that has been devastated by Aids (& has created a shortage of males/their death rates are higher). He also mentions in frustration, that most Namibians are Catholic and the Church refuses to condone the use of contraceptives to combat the epidemic. Bottom line: as in many African countries, strong resilient residents fight to survive against the odds.